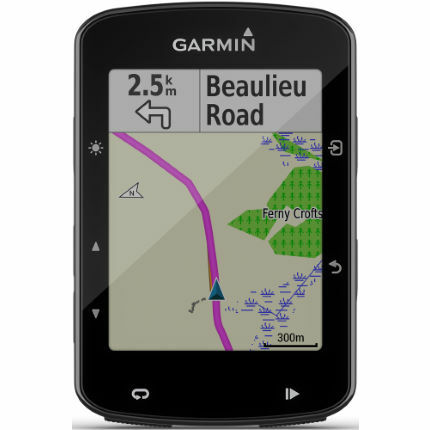 The Garmin Edge 520 Plus will help you train smarter and discover new routes. This cycling computer features advanced navigation and challenges built right in, not to mention a bright colour screen, preloaded Strava Live Segments and the Garmin Cycle Map with turn-by-turn directions. Whether you're exploring new routes or pushing your limits at race time, Edge 520 Plus has exactly what you need. The Plus version helps you when lost, and is smart enough to guide you back to the route, or back to the start if you deviate from it or decide to head home early. Edge 520 Plus is compatible with ANT+® technology sensors, including speed, cadence and heart rate. For even more performance data, 520 Plus is also compatible with ANT+ power meters, including Vector 3 (sold separately). Rider-to-rider messaging lets you send prewritten notes from your Edge 520 Plus bike computer to theirs. Let your friends know if you'll catch up in a few minutes or if they should go on without you. If you have a flat tyre or need assistance, you can send a message to your fellow riders who are paired with GroupTrack, so they can find you. Now even easier to customise your Edge 520 Plus, with the free apps, widgets and data fields you want our the Connect IQ store.